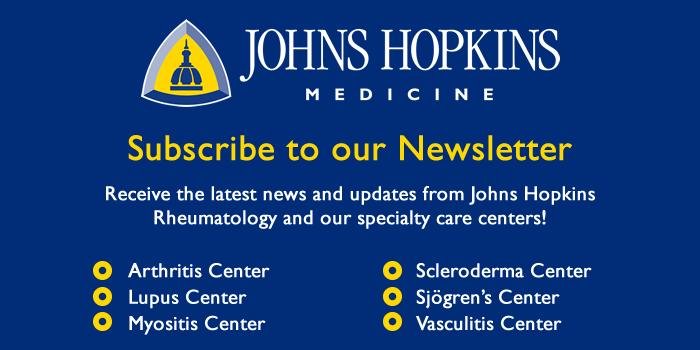 Below is practical information for patients and families, to help prepare for appointments at The Johns Hopkins Scleroderma Center. Park in the Mid-Campus Lot located across from the Johns Hopkins Asthma & Allergy Center. The parking fee (maximum $8.00 – cash only) is charged by the Johns Hopkins Bayview Medical Campus. New patients should arrive 30 minutes early to accommodate parking, Johns Hopkins Security, and the pre-registration process. Returning patients should allow 15 minutes. After registration, you will have your vital signs taken and then you will be asked to complete some questionnaires. The doctor(s) visit will then follow, during which you will be interviewed and examined. The doctor will then discuss with you the nature of your illness and the plans for your treatment. Special testing or further consultation with specialist may be ordered. Follow-up plans will then be decided. Some patients will be asked, if appropriate, to participate in research studies. Evaluations are performed by a scleroderma specialist and possibly a physician-in-training. Please allow approximately three hours for the appointment because various tests might be scheduled. Insurance companies are billed directly. Patients are responsible for amounts not covered by insurance. Please bring all of the appropriate forms and insurance cards. The maximum fee for the first visit is approximately $576.00. Co-payments are collected at the time of the visit. There may be additional fees for imaging studies or laboratory studies. Payments may be made with cash, Visa, MasterCard, travelers’ checks, or personal checks. To cancel appointments, please call (410) 550-7715 within 48 hours of the scheduled appointment.